Unbeknownst to many, July 21, 2012 marks the 45th anniversary of an event that has severely and negatively impacted the life of every single Catholic on the planet; namely, the issuance of a decree by the Congregation for the Doctrine of the Faith (CDF) suppressing the requirements outlined in the Oath Against Modernism. Together with the Encyclical Pascendi Dominici Gregis (On the Doctrines of the Modernists) and the Decree Lamentabili Sane (Syllabus Condemning the Errors of the Modernists), the Oath Against Modernism represented a substantial weapon in Pope St. Pius X’s counteroffensive against the “enemies of the Cross of Christ” (Pascendi 1). In order to give some teeth to his effort to protect the flock from modernist wolves, the Holy Father deemed it expedient to require “all clergy, pastors, confessors, preachers, religious superiors, and professors in philosophical-theological seminaries” to swear the Oath before God; a salvo specifically aimed at those who “put their designs for the Church’s ruin into operation not from without but from within” (cf Pascendi 3). 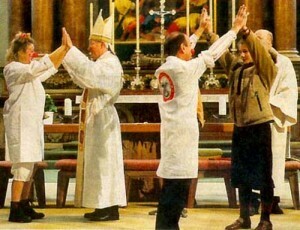 In addition to pledging “wholehearted submission and adherence to the condemnations, declarations, and all the prescripts contained in the encyclical Pascendi and in the decree Lamentabili,” those who swore the Oath agreed to a number of specific propositions, the profession of which would invite derision in far too many “respectable” Catholic circles today. In fact, there can be no doubt whatsoever that legions of clergy, religious superiors, seminary professors and various other “movers and shakers” in the Catholic Church could not, in good conscience, take the Oath Against Modernism if required to do so. This means that the Leadership of Franciscan Provinces of the United States couldn’t take the Oath, nor could anyone who joined them in applauding the Leadership Conference of Women Religious after being called to account for their heterodoxy by the CDF. Neither could Fr. James Martin, S.J., Culture Editor for America Magazine, nor his confrere, Fr. Brian Linnane, S.J., President of Loyola University Maryland, take the Oath without sinning before God as evidenced by the breathless praise each man heaped upon Sr. Margaret Farley after her recently published handbook to guilt-free homosexual debauchery was condemned by the Holy See. These are just a couple of examples illustrated by current events, but you get the point: the precepts set forth in the Oath Against Modernism are irreconcilable with much of what passes for “Catholic” these days. Well, do the math; it’s not complicated. Those who aren’t against modernism are with it, and clearly, just as Pope St. Pius X warned in his day, modernists are operating from within. The difference today is that they do so rather freely. So, why on earth did Pope Paul VI agree to suppress the Oath in the first place? One cannot know for certain, but even so, there seem to be only a handful of possible answers; none of which reflect very well on the Holy Father’s legacy. One possible explanation is that he personally came to believe that certain portions of the Oath (the same to which he himself swore) were incompatible with his vision for the Church going forward. Another possible reason is that he naively believed that the threat of modernism had sufficiently passed. Perhaps the Holy Father simply buckled under the immense pressure being brought to bear by the “enemies of the Cross of Christ” who undoubtedly surrounded him; i.e., at the end of the day, maybe he wilted to the modernists out of fear and weakness. Then again, maybe it was a combination of all of these possibilities led Pope Paul VI to suppress the Oath. Whatever the case may be, nothing good came of it. Absolutely nothing. Now, don’t get me wrong. The Oath wasn’t the be-all and end-all. The simple act of swearing the Oath wasn’t enough to keep the modernists from undermining the faith of the Church any more than taking marriage vows has put an end to adultery. Yes, the Oath may have limited the extent to which the some modernists were emboldened to spread their errors with impunity; but its broader effect went well beyond this. In addition to Pascendi and the Syllabus, it further unmasked the enemies of truth by forcing them, in effect, to abandon the pretense of fidelity, and in so doing it clarified for all of the children of the Church to see what is, and what is not, acceptable. This is how households are run, are they not? When a father establishes clear guidelines for one wayward child; indeed all of the children benefit from the lessons being taught. This brings me to yet another somber anniversary. On July 23, 1967, just two days after the decree suppressing the Oath was issued by the CDF, a group of clergy-educators representing more than a dozen prestigious Catholic Colleges and Universities issued the infamous “Land O’Lakes Statement;” a veritable decree-of-divorce in which Catholic institutions of higher learning proclaimed themselves free of any obligation to the sacred Magisterium. In spite of the fact that many if not all of the clergy-signatories of the Statement had sworn before God to “hold to my dying breath the belief of the Fathers in the charism of truth, which certainly is, was, and always will be in the succession of the episcopacy from the apostles… [and] that the absolute and immutable truth preached by the apostles from the beginning may never be believed to be different, may never be understood in any other way” (cf Oath Against Modernism), they had the audacity to claim for themselves “a true autonomy and academic freedom in the face of authority of whatever kind, lay or clerical, external to the academic community itself” (Land O’Lakes Statement – Article 1). The damage wrought by this academic temper tantrum is evident all around us as “Catholic” institutions routinely reject the moral teachings of the Church and even the existence of objective truth itself. Pope St. Pius X – Pray for us!